(January 9, 2018) For nearly two years SoulTrackers were praying for the health of R&B great Denise LaSalle, who suffered from congestive heart failure and later had her leg amputated. Sadly, we report today that the “Queen of the Blues” has died at a hospital in Nashville. She was 78. 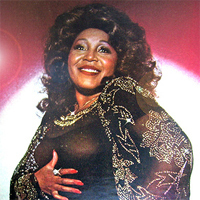 While her commercial success had peaked by 1990, LaSalle continued to record and perform regularly around the world, and continued to connect with blues and Southern soul audiences. She also became a restauranteur through her Blues Legend Café. She won countless awards and is a member of the Rhythm & Blues Hall of Fame. Denise LaSalle was a one of a kind performer, who also paved the way for future artists with her compelling writing and production work. She will be greatly missed.